Hello everyone! My name is Cameron and I am a proffessional window cleaner with the Houston based company SMC Cleaning Service. Today I am going to give you a step by step instructions on how to clean the windows in Houston, Tx like a proffessional. (Disclaimer: I don't suggest any non proffessional attempt to clean tall windows on their own to prevent injury. This article will show you how to clean your lower windows that do not require you to climb a ladder. Here is a list of supplies that you will need to clean your windows. Click on each supply for a link to Amazon for the required supplies. When learning how to clean windows in Houston, Tx, the first piece of equipment to buy is a squeegee. 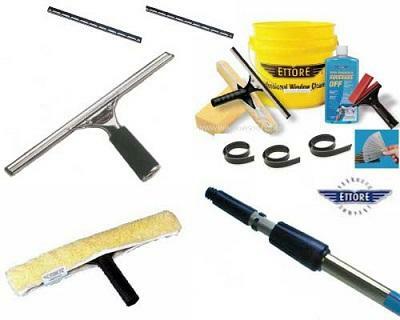 I suggest Etore which is my favorite brand of window cleaning supplies. You also need a scrubber to scrub the windows with cleaning solution. You will also need a bucket to hold the cleaning solution. You can either use an ordinary 5 gallon bucket or you can purchase a window cleaning bucket. The last thing you need are towels. I have found that the best towels to use to clean windows are old or new bath towels. Firstly, follow the directions on the cleaning solution bottle to figure out how to much solution to mix with water in your bucket. After mixing the solution, gently stir the water with your squeegee. Try not to stir the water too aggressively because you don't want your water to suds up too much. The next step is to dip your scrubber into the bucket to get the scrubber wet. You then move the scrubber across the glass making sure that every square inch of glass is wet. Next, you squeegee the water off of the window. You can check out our videos page for squeegee techniques and how to clean windows in Houston, Tx. The last step is to wipe off any remaining water off of your windows. If done corectly, you should only have to wipe the edges of the windows. I hope you enjoyed our article on how to clean windows in Houston, Tx. If this task seems too daunting, give SMC cleaning services a call at 281-899-0402. You can also fill out the form below for a free quote. Thank you so much and best of luck in your window cleaning adventures.